Keep an eye on who's on site for safety purposes with these In/Out panels that can be removed from the wall and carried to assembly points in the event of a site incident. Instantly shows immediately which staff are on site. Cardboard name inserts to show staff names are included. Easy to operate sliders shows IN or OUT status. 3 different panel sizes are available which can be positioned next to each other for increased staff capacity. The panels are pleasing to the eye and won't look out of place in any office. Supplied with fixing kit and screws. 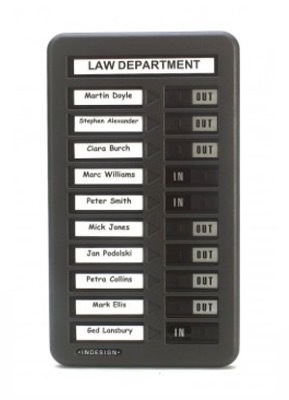 The size of the 10 name board is 360mm (Height) x 207mm (Width).